This industry is filled with amazing and talented artists from all different backgrounds, and it’s always inspiring to get to know them better. 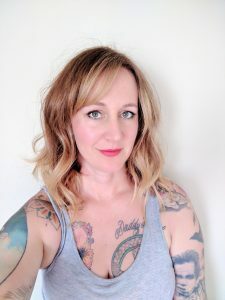 This week, we have Nicole Frost, fiber artist behind Frostyarn, and avid user of Strauch Drum Carders. What got you started in the fiber arts? Like many people in 2008, I found myself unemployed and sheepishly moving back home with my Dad. After packing several lifetimes of drunken debauchery into a few short early-20’s years, I was completely rudderless and newly sober at 25. A fellow sober girl gave me two balls of Lion Brand Thick n’ Quick and said “you’re too crazy to meditate but this’ll help your mind slow down.” From that day in November 2008 to today I have had my hands on fiber (be it dyeing/spinning/knitting/crocheting/carding). Like most people with a highly addictive personality, I fell down the rabbit hole with yarn. Within a few months of learning to knit, my Dad bought me a spinning wheel and a few months after that, a Strauch Finest carder. Then I started dyeing my own fiber so I could control the process start to finish (and save money). I feel like it’s my ultimate creative outlet. Anything space themed! My very first dye batch was based on a nebula and I have been tweaking and refining my technique for nearly 9 years now to get the perfect nebula effect; both when it’s in batt or yarn form AND when it’s worked up. That’s been the real challenge, you have to “think backwards” when you’re dyeing to get something to present beautifully in the batt, in the spun yarn, and in the finished knitted/crocheted/woven item. I have hundreds of failed prototypes and still feel like I haven’t quite got it down yet. I use Pinterest to find great photos of geodes, flowers, beaches etc. to recreate. It’s much easier to design fiber colorways based on a photo references than pull it straight out of my head. I tend to hit the rainbow button if left to my own devices. How do you translate your inspiration into a batt? I use a variety of different fibers to create texture and dye a full spectrum of each possible color on each fiber base. My typical batt will contain a wool top, bamboo, silk, silk noil, bombyx silk, firestar, angelina and wool nepps. Less is not more, more is more. I’ll spend a week or two processing down 50+ pounds of fiber and then card until I’m out. It’s a lot like painting, I’ll often use the silk noil or wool nepps like brush strokes and the silk/bamboo roving and sparkle fibers as the highlights. I often use concepts unrelated to pretty pictures as a form of expression, like what bipolar mania feels like (screaming neon rainbow with rainbow sparkle fiber). I live by the beach in Southern California so a lot of my batts are based on Catalina Island kelp forests, Laguna Beach and other sand and sea themes. What’s your favorite fiber to use? Anything sparkly, I’m like a magpie in that respect. If it’s glittering, my heart is beating faster. Angelina and Firestar are my favorites. Do you have a favorite recent batt that you have made? 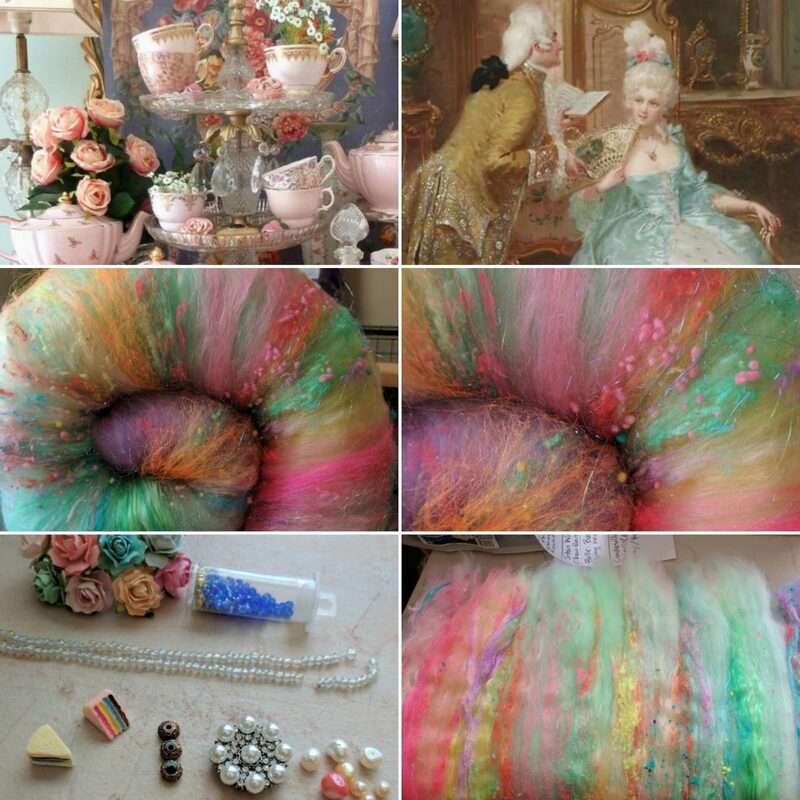 I made an art batt set based on Marie Antoinette with pearls, handmade paper flowers, opalescent glass beads and a ton of soft pastel silk. I watched a documentary on her and did some research on her surviving wardrobe, it was like my head was on fire the whole time I was making it. That’s my favorite part of all of this, when ideas come flying at you like fireworks in your face and you can barely keep up. Why did you choose the Motorized Double Wide Drum Carder? My right shoulder started to ache after years of daily carding, and it was time for me to invest in a motor to allow me to card for longer stretches of time and have a second free hand to manipulate what I’m putting on the drum. What other fiber artists and makers do you admire? Esther Rodgers (Jazzturtle), Lexi Boeger (Pluckyfluff), Nicole Mork (Mork Made Fiber Co), Sarah Roberts (Orange Jellyfish Dream), Amber Churchill (Designs by Amber Fibers), Kat (Studio LKH), Leonor (Felt Buddies UK). If you enjoyed this interview and would like to see more features like this, let us know in the comments! 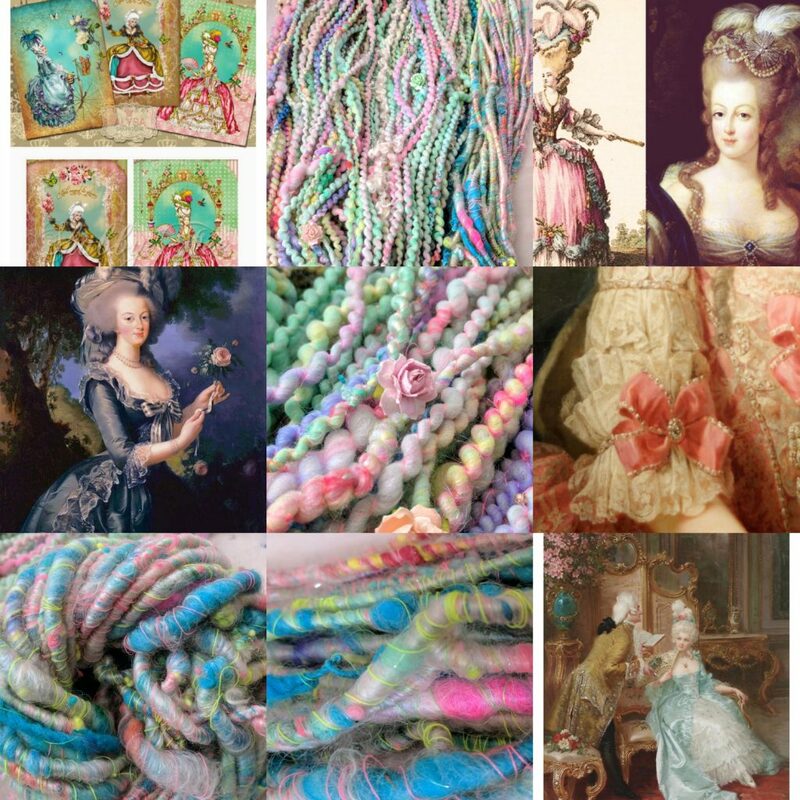 Connect with Frostyarn on Instagram, and while you’re there, be sure to follow us too! This entry was posted in Fiber, Strauch Artists and tagged artist feature, batts, Fiber, fiber prep, frostyarn, interview, nicole frost, strauch fiber equipment. Bookmark the permalink.